There might be a new Doctor in the TARDIS, but that doesn't bother Captain Jack one bit. 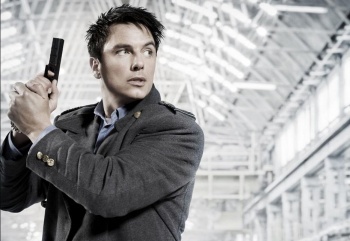 Actor John Barrowman, also known as Captain Jack Harkness, says that not only would he like to return to the Doctor Who fold, it's actually already been discussed. Barrowman first played Harkness in the 2005 series of Doctor Who before going on to star in the spin off series Torchwoord. Harkness accompanied the Doctor and Rose until the end of the first season, where he is killed by the Daleks and then resurrected - and rendered immortal - by Rose when she takes the TARDIS' time vortex into herself. Unfortunately, he is left behind, and is forced to make his own way back to Earth. He crosses paths with the Doctor on a number of occasions after that, most recently the episode "Journey's End," where he helped the Doctor foil another Dalek plot. Harkness is also notable for being the first openly non-heterosexual character in the Doctor Who TV show. Barrowman said that he would return to Doctor Who at the "drop of a hat," although he did express a certain amount of regret that he wouldn't get to work with David Tennant again. "I like Matt Smith," he said. "He brings his own quirkiness to it ... There's a whole new generation who are now attached to Matt, and rightly so ... but David Tennant is my Doctor." It would be interesting to see Captain Jack back in the TARDIS again. He's the same kind of character as River Song - the experienced time traveler/adventurer - but doesn't have quite as much romantic baggage, although it's hard to imagine him not flirting with Matt Smith's Doctor. The interaction between Jack, Rory and Amy, assuming that they all ended up in the TARDIS together, could be a heck of a lot of fun to watch as well.